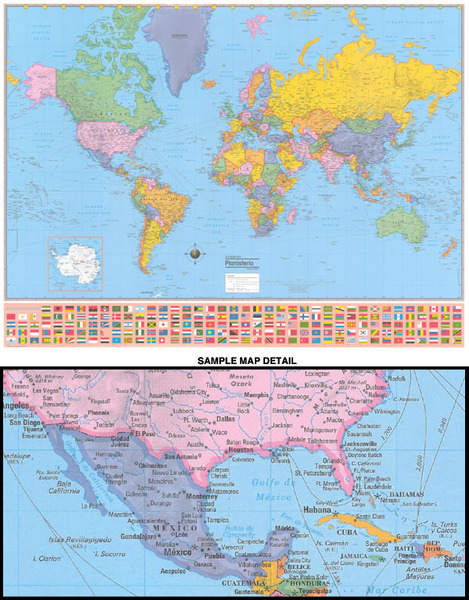 The Hammond World Wall Map in SPANISH – Mapa, Mapas de el Mundo oversized, Spanish Text edition, political world wall map available in paper, laminated, canvas or framed. Hammond World Wall Map in SPANISH – Mapa, Mapas del Mundo: This brand new oversized political world wall map features all new cartography and distinctive color banded borders for easy recognition. Originally designed for classroom use, it displays equally well in a home or office setting. The laminated surface enhances the colors and permits annotation with dry erase markers. Chart the route of friends, relatives and associates as they traverse the globe. It’s also an eye catching geography lesson, room enhancer, or sales and marketing presentation waiting to happen! 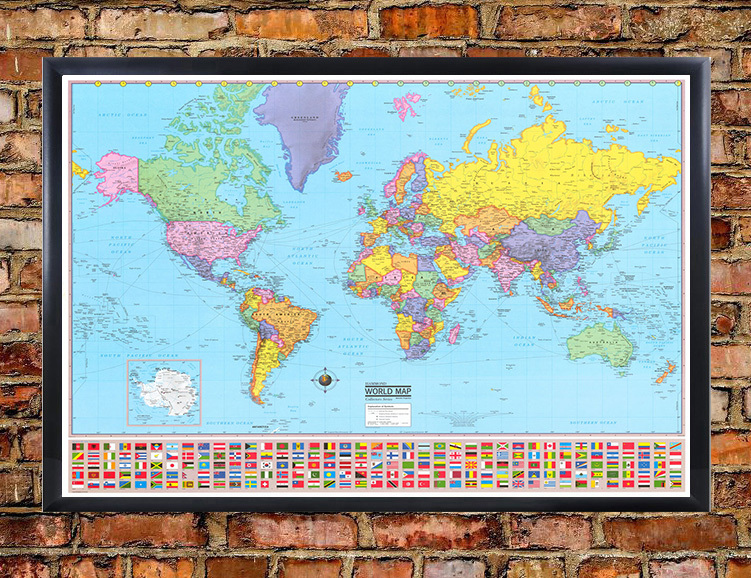 This map is available in paper, laminated, laminated with wooden rails or framed. Each laminated edition includes a revolutionary new UV laminated coating for years of enjoyment and dry-erase. Unlike traditional heavy film laminates – the NEW UV coated laminates stay flat without prolonged curling issue and more importantly will not crack and peel over time. Note: only dry-erase markers should be used on gloss coated laminate maps for write-on and wipe-off! Wallpaper editions are now available in classic wallpaper (needing standard wallpaper pastes) or a new revolutionary wallpaper called QuickStik!! QuickStick is a pre-pasted wallpaper that only needs water applied with a spray bottle to the back surface for application. It’s as simple as that! Why deal with messy glues and wallpaper pastes? NO MORE!! Another great benefit of QuickStick is that it can be easily removed without damaging the wall surface. We are proud to be the exclusive USA map company specializing in this new wallpaper media. Peel n’ Stick is a self-adhesive format which can be repeatedly removed and reapplied without losing its sticky properties. Adheres to almost any smooth wall (flat) surface including drywall, wood laminate, wallpaper, foam board, glass, tile, paint. The map can be removed at any time and relocated or stored using the backing paper supplied. NO screws, rails, nails, pins, hooks, strings, tape or glue are required to mount this product – the special adhesive backing does all the work. Simply peel your map and stick it! Peel n’ Stick products are printed with fade resistance inks on a specially designed 3 layered vinyl, for the perfect clarity, color reproduction and durability. Peel n’ Stick will not tear or crease and feel like a high quality map. Want to relocate your map? Simply peel and replace on a different wall, or reapply to the backing paper supplied for transport or storage. Now you can display your map where you want it, when you want it. Peel n’ Stick will change the future of wall maps and wall murals worldwide and we’re proud to be leading the way. 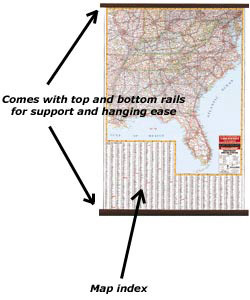 SWIFTMAPS is proud to now offer their own line of framed wall maps. We have chosen the top selling finishes of wooden framing and made them available with many of our popular wall maps. All wooden frames are produced with top quality products and professional framers and include all mounting hardware for easy hanging. Our line of wooden frames are 1 – 1/2″ in width. We have found this to be the most popular size for wall maps. 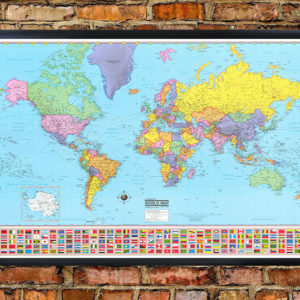 All framed maps are first mounted to a heavy duty foam/cork board, perfect for using push-pins, then laminated with a professional protective 3mil plastic laminate to give your map a durable layer of protection from dirt, oils and moisture – along with dry-erase pen use. Custom decorative framing and non-glare glass are available for special order on request. Please contact us for custom requests. If you want it, we can make it!! Email us at [email protected] with any questions. Please note that all framed maps are very fragile and require a heavy duty custom crate for shipping. We take pride in making sure you receive a perfect shipment!